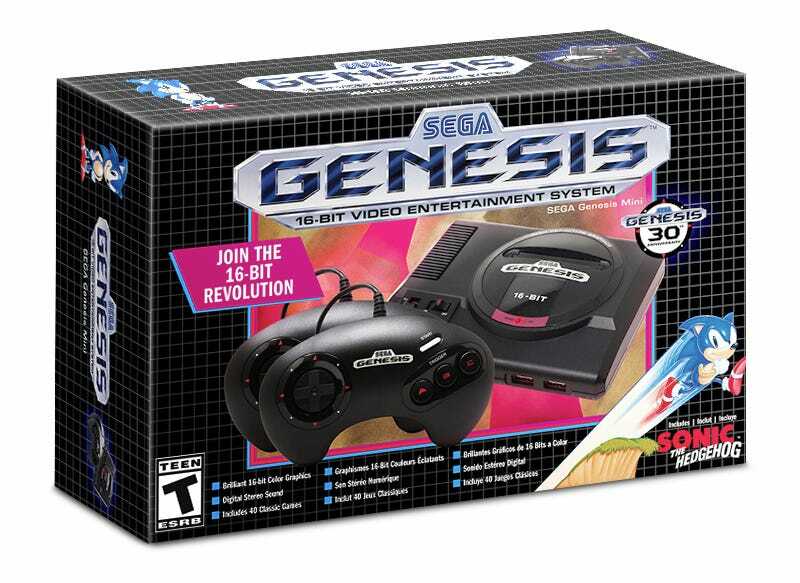 Sega will release its Sega Genesis Mini worldwide on September 19, it said today. It will include 40 games, including Sonic The Hedgehog, Gunstar Heroes, and Castlevania Bloodlines. Sega made the announcement on stage at Sega Fes 2019, its annual fan event in Tokyo. There, it announced games for the Japanese Mega Drive Mini, including Sonic 2, Puyo Puyo 2, Shining Force, Castlevania Bloodlines, Powerball, Gunstar Heroes, Comix Zone, Rent-a-Hero, Space Harrier II, and Madou Monogatari Ichi. Since a few of these games are Japan-only, it stood to reason that the U.S. and European lineups will be different. In a separate presentation at Sega Fes, Sega said that M2, the developer behind Sega Ages, is creating the software for the device. It also said that the system will include different regional variations of some games. For example, the Mega Drive Mini in Japan will include the U.S., European, and Japanese versions of Castlevania: Bloodlines. It didn’t say if the overseas versions of the device would similarly contain different regional variations, but it seems likely. While Sega was light on details about the Mega Drive Mini in its stage presentation, it did say the six-button controller would be the same size as the original, and that the games would have a save-anywhere function. The menu music for the device was composed by legendary Streets Of Rage composer Yuzo Koshiro, which is totally wild. While the Japanese version will include six-button controllers, the U.S. version will ship with two three-button Genesis controllers that connect to the Mini via USB. Original Genesis controllers won’t connect. In Japan at least, it will be sold in two variations: with one controller for 6,980 yen (about $60), and with two controllers for 8,980 yen (about $80). The U.S. version will cost $80. Promotional images of the Gensis Mini from Sega’s official site. Sega first announced the Mega Drive Mini at last year’s Sega Fes, and it was originally supposed to be released in 2018 only in Japan and based on the same AtGames-developed technology that powered the U.S. exclusive Genesis Flashback HD. Later, it delayed the unit into 2019, saying that in order to achieve a higher level of quality, it would drop AtGames, develop the software for the system in Japan, and release the unit worldwide. Given the generally negative critical reception to the Flashback HD, especially compared to Nintendo’s mini classic systems, Sega seems like it’s aiming to salvage its brand’s reputation in the classic-console market. Update - March 30, 9:30am: This post has been updated with information about the hardware and games for the Genesis Mini, which will be sold in the U.S. Features Editor, Kotaku. Japanese curry aficionado. Author of the books Power-Up: How Japanese Video Games Gave the World an Extra Life and Final Fantasy V from Boss Fight Books.